Artists Bradley Eros and Jeanne Liotta, former partners in art and life, reunite to perform together for the first time in over fifteen years. In “Subverted Horseplay” (1994-97), the last performance work of their nearly decade-long collaboration Mediamystics, the mythology of Cowboys and Indians as derived from Hollywood movies and other mass media is subverted through manipulations of the projectors and other interventions that as described by the artists alter and result in the opening of “these fixed iconic pictures to a shifting resonance within their cultural reception”. The performance, first presented at Exit Art in 1994, accompanied by the music of Circle X, also includes readings and a live mix of sound on tape by the artists. Together the pair, who resided in New York’s Lower East Side, created a body of influential and intense films and performances often highlighting the alchemical, transient, and mysterious nature of the filmic image. Bradley Eros is an artist working in myriad mediums including film & video, collage, performance, contracted and expanded cinema, and installation. Eros' works have exhibited and screened extensively in the US and abroad including at Microscope Gallery, The Whitney Biennial, The Whitney Museum’s series "The American Century", The Museum of Modern Art (MoMA), MoMA PS1, Participant Inc., The Kitchen, Performa09, Exit Art, Anthology Film Archives, The Andy Warhol Museum (Pittsburgh, PA), Camden Arts Center (London), Arsenal (Berlin), and The New York, London and Rotterdam Film Festivals. Collaborations include the Alchemical Theater, the band Circle X, Voom HD Lab, and the expanded cinema groups kinoSonik, Arcane Project and currently Optipus. 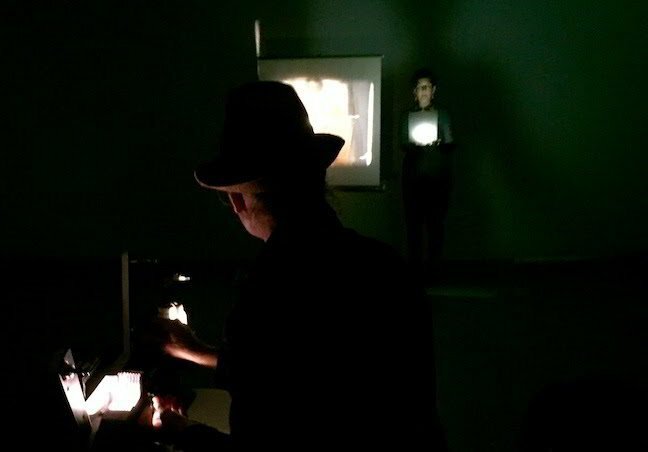 Jeanne Liotta was born and raised in NYC where she makes films, cultural ephemera, collages, live projection performances. Her work is known for taking place at a curious intersection of art, science, and natural philosophy. Her 16mm film “Observando El Cielo” was voted one of the top films of the decade by The Film Society of Lincoln Center, was awarded the Tiger Award for Short Film at Rotterdam International Film Festival, and was selected as one of Artforum’s Top Ten Films of 2007. Her work has been presented in the Whitney Biennial; The New York Film Festival; KunstFilm Biennale, Cologne; The Wexner Center for the Arts, The Exploratorium; and Centre Georges Pompidou, among others. She is currently on the Faculty at the University of Colorado Boulder and is Co-Chair of Film/Video at the Milton Avery Graduate School for the Arts at Bard College. Liotta lives between New York and Denver, Colorado. About “Dreamlands: Immersive Cinema and Art, 1905-2016"